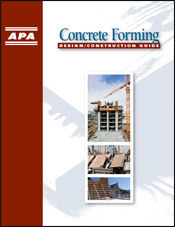 The following is adapted from the Grade-use Guide for Concrete Forms table on page 5 of the APA Design/Construction Guide: Concrete Forming, Form V345. Please refer to that publication for examples of typical trademarks. Specifically manufactured for concrete forms. Many reuses. Smooth, solid surfaces. Mill-treated unless otherwise specified. 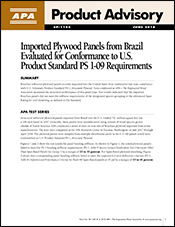 Learn more about APA B-B and B-C PLYFORM Class I panels and view product manufacturers. Typical APA B-B PLYFORM trademark shown. Hard, opaque resin-fiber overlay, heat-bonded to panel faces. Smooth surface resists abrasion. Up to 200 reuses. Light application of releasing agent recommended between pours. Learn more about APA HDO – Concrete Form – PLYFORM Class I panels and view product manufacturers. Smooth, opaque resin-fiber overlay heat-bonded to one (typical) or both panel faces. Smooth surface resists abrasion. Normally factory-treated with a release agent. Light application of releasing agent recommended between pours. Learn more about APA MDO – Concrete Form – PLYFORM Class I panels and view product manufacturers. The following is adapted from the Grade-use Guide for Concrete Forms table on page 5 of the APA Design/Construction Guide: Concrete Forming. Please refer to that publication for examples of typical trademarks. Especially designed for engineered applications. All Group 1 species. Stronger and stiffer than Plyform Class I and II. Recommended for high pressures where face grain is parallel to supports. Also available with High Density Overlay or Medium Density Overlay faces. 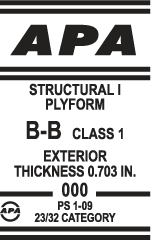 Typical APA STRUCTURAL I PLYFORM trademark shown. Produces a smooth uniform concrete surface. Generally mill treated with form release agent. Check with manufacturer for specifications, proper use, and surface treatment recommendations for greatest number of reuses. Learn more about other proprietary concrete form panel types and view product manufacturers. Sanded panel often used for concrete forming where only one smooth, solid side is required. 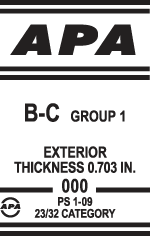 Typical APA B-C trademark shown. * Commonly available in 19/32, 5/8, 11/16, 23/32 and 3/4 Performance Categories (4' x 8' size). ** Check dealer for availability in your area.